Search engine magic delights me. I’m never far from the Internet and its resources. At work I’m frequently checking addresses, phone numbers, and bits of esoteric information for clients, reading and sending email, and making little forays into Wikipedia when I hear something interesting on the radio. At home I play “where have I seen that actor before?” by checking program listings on TV.com. I usually use Google, and I usually find what I want on the first page of suggestions. What amazes me is when the search engine throws together a few bits of barely remembered information and finds what I’m trying so hard to remember. We have a blind kitten at the Scorekeeper. Pepper is friendly, active, adventurous and apparently fearless. Although two vets have assured Jo Anne that Pepper is totally blind, it’s hard to believe as we watch her run around the house and respond to our voices. This morning she climbed a pile of four storage boxes to bat at the tail of Sam Spade, one box higher and easily four times her size. Watching her this morning, thinking that she has no idea she’s missing a sense that the rest of us can barely imagine being without, tickled a vague memory in my mind. Long ago, I remembered, I read a novel about a society of people living in total darkness, not knowing of any other way of life. What the heck was that book? I had no idea what the title was, although I had a vague idea that the author’s first name was Daniel (don’t ask me why that stuck with me). So I went back to my computer and typed “science fiction blind society daniel” into the search box, and a few seconds later I had it all: Dark Universe, by Daniel Galouye, published in 1961, nominated for the Hugo Award (Robert Heinlein’s Stranger in a Strange Land won that year), one of the many post-nuclear-war stories so popular in the 50s and 60s, and long out of print. The other way around is fun, too: how do people find me here? WordPress saves all the search terms used to find my blog, and some of them are pretty funny. The biggest share appear to be people who are actually looking for me (amazing in itself), but a good many of the others must be a bit surprised to arrive here. A remarkable number of people looking for information on the late Phyllis Whitney land here, asking “is Phyllis Whitney dead? (yes, but she lived to 105), “which Phyllis Whitney book featured kudzu?” (several of them, I think), or “why is Phyllis Whitney not on Kindle?” (beats me). A couple of people arrived wanting to know how to get out of jury duty in Harris County (I don’t approve of weaselling out myself, although I wouldn’t want someone on my jury who really didn’t want to be there). Someone found his way here by searching for “where were you last Pluterday word” (I didn’t think anyone else even remembered that book!). I have no explanation for “whitney hudson nasa,” “romance novel freddie and taylor,” “conference shoes,” or (my current favorite) “soaftware for ntc dream writer it word processor.” But welcome, everyone. I’m delighted by your visit, no matter how you got here, and I hope you will find something entertaining while you wander around my little domain. 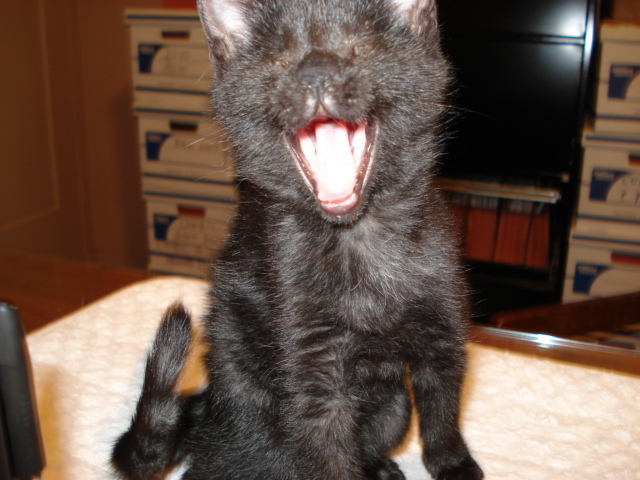 Here’s Pepper the blind kitten doing her imitation of a wolverine (photo by Jo Anne Banker). Previous Contest judging has been keeping me busy, Next Digital camera, Brownie brain. Isn’t the Internet great? And it’s made research for writers into a whole new ballgame. I’d love to own some Google stock but even in a dipping market it got too expensive too fast. I admire the genius behind search engines but am wary of Wikipedia. I always cross check everything I find there because I’m not sure how the info is vetted. It’s a fount of good ideas though for the creative mind. Love your bold kitty. Don’t tell her she’s visually impaired and she’ll never know. Don’t worry, Pepper doesn’t suspect a thing. I don’t think the other cats know, either. They certainly don’t cut her any slack. Wikipedia is my favorite place for finding things quickly, like Cliff’s Notes for the universe, but when it comes to serious research, you still can’t beat books. Which brings us right back to the Internet, where you go to find the books!